This 해리 포터 대 트와일라잇 fan art contains 기호, 포스터, 텍스트, 칠판, 사인, and 서명. There might also be 신문 용지, 잡지, 타블로이드, 걸레, 신문, 종이, 타블로 이드, and 걸 레. Three words: already been posted. 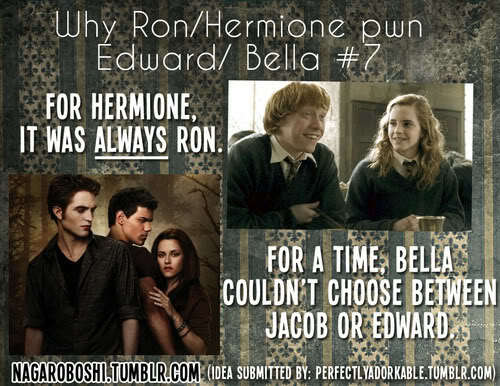 All the "Why Hermione/Ron beat Edward/Bella reasons have been posted. hermione and ron ere meant to be i mean u cant spell hermione without spelling ron and she only went with victor cause ron had not asked her first dont u remeber their fight in hp 4 ? TrueTwi_hard: Well, I wanted to say you do know that Hermione never really had a thing for Victor, right? They went to the Yule Ball and even then, Hermione had feelings for Ron. She went out with Krum because Ron didn't ask. She went out with McLaggen because Ron was being an arse with Lavender because of something Ginny said because Ron was being overprotective.